The actual size of music-related areas in the brain, such as the auditory cortex, cerebellum (responsible for motor coordination) and motor cortex increase with music training. And, importantly for parents of preschoolers, according to a 2004 Scientific American article, Music and the Brain, “the extent of increase is greater the earlier the music lessons began.” These gains produce lifelong benefits: researchers at the Chinese University of Hong Kong concluded that adults who had studied music as children had improved verbal memory. There have been a number of references to the correlation between music training and academic performance, including the College Board’s report on SAT scores where students who took courses in musical performance scored 22 points higher in Math and 28 points higher in Critical Reading and Writing (2009 data). However, the McMaster and Boston College research went beyond correlation: they demonstrate a high likelihood of causality in that the control group did not see similar test gains nor changes in brain activity. Interestingly, studies to date have not determined any particular area of the brain that specializes in music. Rather, music appears to engage various areas of the brain responsible for other cognitive functions. Indeed, it may be that the mental gymnastics needed to process music across multiple regions of the brain (including both hemispheres) is precisely the workout that results in the observed intellectual gains. * Dr. David Perlmutter M.D. and Carol Colman, authors of Raise a Smater Child by Kingergarten: Raise IQ by up to 30 points and turn on your child’s smart genes recommend formal music training by age 4. Because the piano engages both hands, it’s a great choice to develop fine motor skills on both sides of the brain/body. 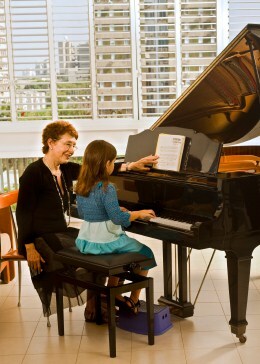 * At any age, you can encourage music appreciation in your home by playing music of different genres. * Likewise, singing with your child is a fun way to build interest in music early on. Pre-verbal children can use baby signs to “sing along” to simple songs like Itsy-Bitsy Spider and Twinkle, Twinkle Little Star. When your child starts to speak, encourage her to sing the lyrics and change up the words to her favorite songs. Entry filed under: Music & Art. Tags: brain, brain development, fine motor skills, IQ, literacy, memory, music training, piano, reasoning, SAT, singing, songs, verbal skills, vocabulary.